Someday your prince will come, but first you have to kiss a few frogs. I know I said a little bit about our new Frog Prince Bridal Shower Theme in a previous blog, but I just think it’s so adorable and unique that I had to devote a whole post to it. Every little girl dreams about finding her prince charming. Most of us, as adult women, know it’s not as easy as it seems. There are a lot of frogs out there and we have to wade through them to find the right guy. When you find him that’s when the planning begins! First you have to select the guest list. This can be more complicated than you think. You have to decide if this will be a couples shower or ladies only. Should it be a family only shower? Just friends? Or a mixture of both? Once you have the guest list ready you have some invites to address! Filling out those invites can be a daunting task. We’ve made that process a little easier by offering Personalized Frog Prince Bridal Shower Invitations. Let us do the work! You provide us with the Bride to Be’s name, the date, time and place for the shower. We’ll also put the hostesses’ contact information down so people can RSVP. Once the invites are on their way and responses are starting to roll in, it’s time to start ordering the party supplies. You’ll need napkins, plates, napkins, cups and silverware. We have lots of fun solid colored plates that you can mix and match with our Frog Prince Beverage Napkins. Using solids is not only budget conscious, but also makes accent pieces easy to find! Now comes decorating. Our Deluxe Party Favor Display Stand does double duty! It works as a centerpiece and a display area for the cute favors your guest will take with them when the shower is over. We chose the Prince Charming Candle Favors . They are so cute! Don’t forget to get some balloons to either mark the shower spot or dress up the cake table! Next comes the food. Your guests will arrive and they will be hungry. All that is really required is cake and something to drink. Don’t let that stop you! 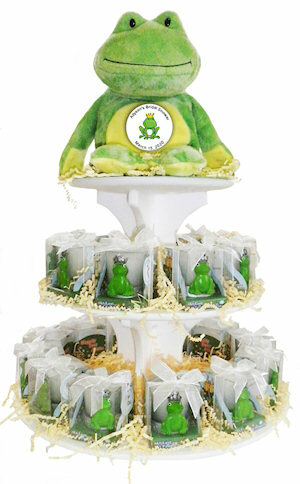 We do have a few food ideas on our Frog Prince Bridal Shower page. If you have more or some must have munchies, please feel free to leave it as a comment. Once your guests arrive you want to make sure they are having fun. Games have never been easier than our Personalized Frog Prince Scratch Off Game Cards. Quick, easy, unique and personalized for the honoree. Lastly, the bridal shower is about making memories for the bride as well as helping the couple start out their new life together. 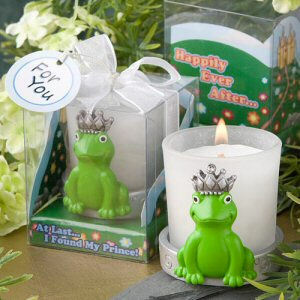 We suggest putting a Personalized Frog Prince Bridal Shower Advice Card at every place setting. Guests from young to old will have advice to give to the new bride. These cards can be treasured for years to come in a scrapbook, or put away in a time capsule to look on later in the marriage. I am so excited about this new line. It’s so festive! Why not celebrate the bride to be finding her Prince Charming and starting her happily ever after with a Frog Prince Bridal Shower?